Greetings from Veeam Support and welcome to the next episode of our troubleshooting series! In this article, we will review how to resolve an issue that might be caused by a mismatch between the block size set in your Veeam tape drive properties and the one actually supported by the tape device itself. You will learn why block size can be different and how to fix it. And even if you’ve never come across such a problem, you may also find this post useful, as under certain circumstances changing the block size can help you increase the processing rate. This is because when you have a higher block size, the drive is supposed to write data more quickly. Something bad happened with your HBA controller and you had to replace it. Meanwhile, your Veeam Server stays the same (i.e. the OS and the application were not re-installed), and the tape library and the drive were not changed as well. You set up everything and your boss asked you to restore a VM from some old tapes written a day before the HBA controller replacement. You see an “Error: Invalid block size” alert. [timestamp] <08> Info [AP] (0f3e) output: --tr:Tape initialization FAILED. Once you are done checking the logs, verify what block size is mentioned in the settings of the Veeam tape drive. If you can change it to the one that was used to write the data to tape, the issue is likely to be resolved. However, if you see that the maximum block size is lower than you expected, go to the Device Manager and verify the block size mentioned there. If there is any mismatch and the maximum available block size in the Device Manager is larger than the one in Veeam Backup & Replication, you are facing the same behavior we are investigating here. For example, in the support case that became the blueprint for this article, the Veeam drive settings showed the maximum available block size of 512 KB. However, in the past there was a possibility to choose a bigger block size. And in the Device Manager, the maximum available block size was 8 MB. So why do we have this restriction in Veeam, while the driver itself allowed the use of a bigger block size? To figure this out, let’s go deeper. To resolve the issue, you need to determine what block size is supported and configured for HBA and align it with the one you want. After you change the block size, you need to run “scan for hardware changes” in the Device Manager. Once changes are applied for the drive, don’t forget to restart Veeam Tape Service. There can be different scenarios for different vendors, which can easily be found on the internet. Further in this article, we’ll provide an example based on the HPE QLogic device. 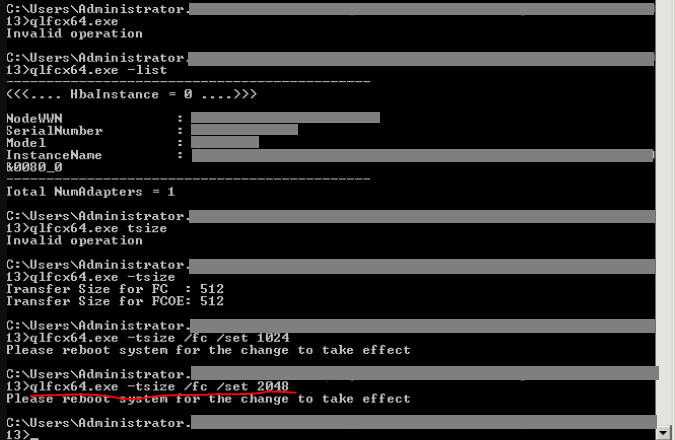 HPE provides an official article on changing block size in a QLogic HBA. 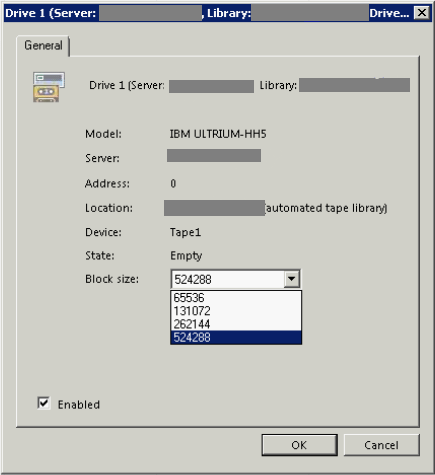 To manage settings, we downloaded a specific tool for our tape server's OS from the HPE QLogic site. After that we set a new block size with the command -tsize /fc /set 2048 and were able to select a bigger block size in Veeam Backup & Replication. Keep in mind that you need to set the block size used previously for writing the data to this specific tape. 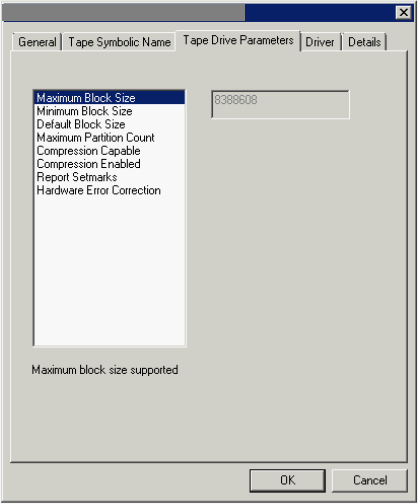 The issue with the invalid block size can appear not only during restore operations but also during inventory or cataloging. You should always keep in mind that whenever there are changes there are consequences. Check carefully for limitations, find the mismatches and try to fix them. Otherwise, we are always here and ready to help! Kira is a Tier-1 technical support engineer at Veeam. Her passion is troubleshooting and root cause investigation. Kira is enthusiastic about Veeam’s innovative solutions and features such as backup to tape, WAN acceleration and Veeam Explorers for application-item recovery.